Enter the new KFC Legendary Deliveries NBA Contest, in it, you get the chance to Win NBA prizes. Entry to this contest is open only to legal residents of Canada (except the province of Quebec) who are at least 16 years of age. 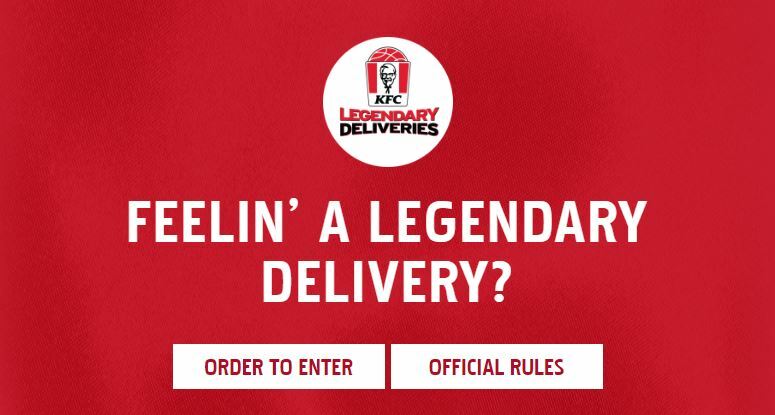 To enter you have to place an order on KFC delivery online through the link located at kfc.ca/legendarydeliveries and choosing to enter the Contest by clicking the check-box that appears at checkout. You will get one entry for each purchase through the site. The contest closes on Wednesday, April 11, 2019 at 11:59 pm ET. Winners will be chosen by random draw from all eligible entries. The KFC Legendary Deliveries NBA Contest will be open from Friday, January 25, 2019 at 12:01PM ET to Wednesday, April 11, 2019 at 11:59PM ET. The draw will take place on February 19, 2019. Winners will be notified by email.